We are social scientists and other scholars who want to improve our academic disciplines. We have all written about a particular problem: the loss or lack of “viewpoint diversity.” It’s what happens when everyone in a field shares the same political orientation and certain ideas become orthodoxy. We have come together to advocate for a more intellectually diverse and heterodox academy. American universities have leaned left for a long time. That is not a serious problem; as long as there are some non-leftists in every field and every department, we can assume that eventually, someone will challenge claims that reflect ideology more than evidence. But things began changing in the 1990s as the Greatest Generation (which had a fair number of Republicans) retired and were replaced by the Baby Boom generation (which did not). As the graph below shows, in the 15 years between 1995 and 2010 the academy went from leaning left to being almost entirely on the left. 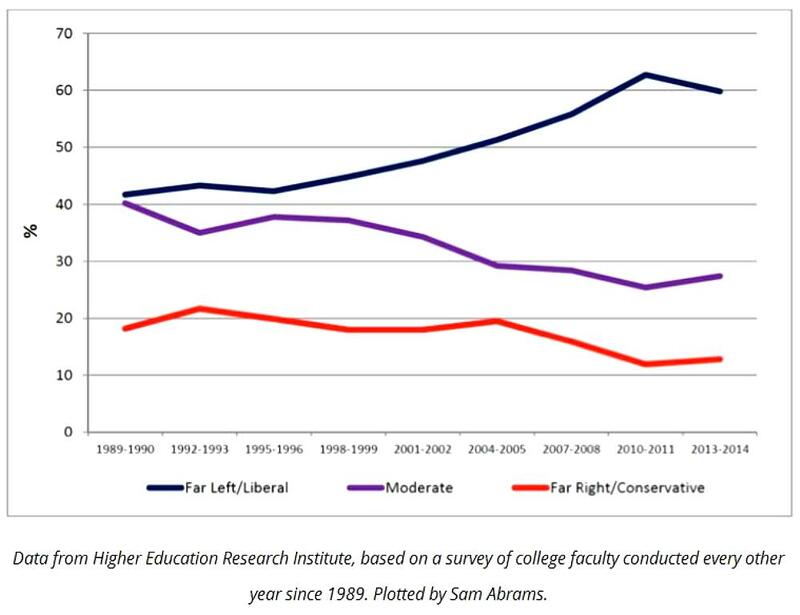 (The 12% in the red line for 2014 is mostly made up of professors in schools of engineering and other professional schools; the percent conservative for the major humanities and social science departments is closer to 5%). Contributors to the site are all "professors, researchers, or graduate students." Among the names I recognized in the list of contributors were Jonathan Haidt, John McWhorter, Steven Pinker, and George Yancey. .... We don’t all agree about the nature of the problem or its solutions, nor do we all endorse every blog post. But we all agree that our academic fields (and many others) would produce better and more reliable research if they contained more viewpoint diversity. We have come together to search for ways to address this problem and improve the academy. This is a site I will re-visit.